As I mentioned almost a month back, I was going to read another Twin Peaks tie-in novel (well, not exactly a novel), The Autobiography of FBI Special Agent Dale Cooper: My Life, My Tapes, originally published in 1991. I read it and was glad I did, since it did fill in some questions the original TV series left - even though it also made me want to know more (which means I'm a fan, and I am, even though now that I checked the Wikipedia entry for the series, I learned more than I already knew in just a couple of minutes). The writer, Scott Frost, is the Twin Peaks creator Mark Frost's brother and wrote some of the episodes of the series. He seems to have written two thrillers in recent years. The Finnish newspaper, Helsingin Sanomat, recently published an article about how the Finnish used book trade is going through a crisis. There's no new generation coming along to keep the stores up and running and the costumers aren't buying their books from the used book stores ("divarit" or "antikvariaatit", as they are known in Finland). It was said in the article that people especially don't want to buy their bestsellers used and that the stores won't even take them in. While there's some truth in this - several used book stores have ceased during the last ten years - you might want to note that it's really been a fault of their own. During the last fifteen or twenty years the used book stores have tried to maintain a level of cultural dignity and have kept a very high-brow attitude and been neglecting the costumers who just want to read something light or popular. Hence there is no generation at the moment who would know to seek latest door-stoppers at the used book stores. It's no wonder no one comes asking for them, because they are used to the fact that there are only some obscure collectibles and dusty piles of books no one's ever heard of. One might also want to note that there are whole new venues for buying old books: the web (especially Huuto.net, the Finnish equivalent of eBay) and the flea markets where there are usually several traders shopping used books (usually with ridiculously high prices, higher than the used book stores). It's been said that people are getting bored to shopping on-line, but I don't think that's the case with used books. A man called Esko Hamilo has just been appointed a special assistant to the Prime Minister of Finland. A name struck a memory chord and I had to check: yes, he was the man who translated a good chunk of crime and mystery novels in the sixties, seventies and eighties. He did the Finnish translations of Ross Macdonald's The Galton Case (as Rouva Galtonin perillinen, 1981) and The Chill (as Tappotuomio, 1985). He also did several Mickey Spillanes and The Friends of Eddie Coyle by George Higgins and John Godey's Taking of Pelham One-Two-Three, as well as The Other by Thomas Tryon and a Shell Scott paperback by Richard Prather. All American crime classics. The best-known of the books Hamilo translated is Bury My Heart in Wounded Knee by Dee Brown. Here's hoping he recommends some of those books to the Prime Minister. The holiday seems to be over. It's Kauto's last day home before the kindergarten opens again. It's only appropriate that it's raining like hell. Well, we got to swim last Thursday when it was still beautiful and warm, and Kauto liked it so much that it was hard to get him out of the pool. Ah well. This goes by. It's always gone. What I'd really like to know is that is there a writer, non-fiction or fiction, who likes to be criticized? Is there someone who really likes the editing process, with someone trying to get in and change the text that is so dear to the writer? Of course the text usually (and I believe that in this case this will happen) gets better, but the actual process? Since I haven't been blogging for weeks, there are lots of books that I've read and should be blogging about (and over on Mystery*File's blog I made a promise to write about the two John Marshall Tanner books by Stephen Greenleaf I recently read), but we'll see what I'm really going to do about that. I'll be having a hell of Fall ahead of me, with too many deadlines, and I'm afraid I'll have to cut down my blogging. Or at least something needs to be done in order to get the jobs finished. Ah well. Now I'm gonna go and have the rest of my holiday. PS. I heard a rumour someone's circulating my interview from a small newspaper in e-mail. Is this true? Please, let me see myself! At least it shouldn't be. Even grandmothers have laptops now and an unlimited access to the net. However I haven't been writing exactly because of we've been travelling. We were at a christening (is that the right word here?) of a friend's newborn baby and then we were at the museum railroad in Humppila (highly recommended if you're into narrow gauge railways; for Kauto it was a bit of a too exhilarating experience and we'll have to come back for more in two or three years) and then we came to visit Elina's parents in Hämeenlinna. I managed to blog a great deal at my other blog: it's an entry for Gil Brewer from my first book, Pulpografia, with a foreword and corrections. Here. In an earlier post I mentioned an Australian paperback western by Clay Anthony, also known as Don Haring. Here's the quite garish Finnish cover. The original title for the book is The Good and the Evil and the publishing year is 1977. I've been thinking about compiling a reference work about Australian pulp fiction, but there are tons of Australian westerns in the market... Everytime I take a look at these Colt and other Finnish western series, I'm exhausted by the idea of having to read hundred stories by Cord McCabe, two hundred by Emerson Dodge, three hundred by Brad Cordell... Maybe dozen by each would just about cut it. Later, later. I'd just have to get my Pulpografia Britannica ready. Do you think the book on Australian pulp could be called "Pulpografia Australiensis"? From Todd Mason comes this suggestion to check out Pistol Valve, a Japanese hard-rocking band with full brass section. I had a chance to read some other books as well during our cabin trip. They were all better than Paul Malmont's Chinatown book. I had two short Australian paperback westerns with me. 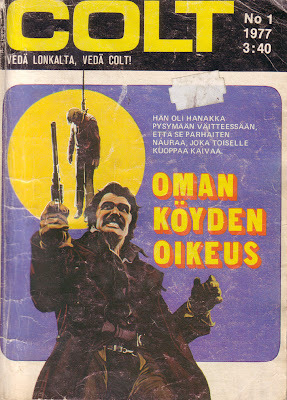 I don't have Clay Anthony's book with me right now and I already forgot the original title, but the Finnish title for it was Oman köyden oikeus (meaning Rope Justice). Clay Anthony was really Don Haring whom someone might recognize as the writer of the Larry Kent series and even though there seems to be a consensus that Larry Kent was bottom of the barrel, I actually enjoyed Don Haring's western quite a bit. It's a fast-moving story of two young men who end up in the both sides of the law and have to duel to death in the end. The other I read only when we got back from the trip - Cord McCabe's Kostajan ase ei kylmene/Trail to Eternity (the Finnish year is 1974; I don't know when the original was published, but it must've been by Cleveland). It wasn't as good as Anthony's - the plotline was too thin and the narrative too loose. Cord McCabe is (was?) really an Australian writer called R.J. Fittock who also wrote as Walt Beaumont and Lou Donovan. The Finnish title means The Revenger's Gun Won't Get Cold. The McCabe book was published in the Arizona series, Anthony's book in the Colt series. Both were long-lived digest-sized paperback series. I started Paul Hamill's The Deadly Piece (1979) and finished it when we got back to Turku. Hamill's hero is Sam Briscoe, a tough newspaperman who seems to get into trouble and resolves them with his fists and wit. There's a melancholy feel to the book even though it's strictly hardboiled. I liked this quite a bit and could read more of Hamill's Sam Briscoe novels. Hard Case Crime reprinted recently one of Hamill's other Briscoes, The Guns of Heaven. I haven't really seen any reports on the book, but I remember stepping upon a negative comment. Wouldn't really be so harsh based on The Deadly Piece. I also read Jennifer Lynch's Twin Peaks tie-in, The Secret Diary of Laura Palmer. You may remember (I mentioned this only in passing, though) that I watched the reruns of Twin Peaks on the Finnish television couple months back and was captivated once again. I remembered that I'd never read the two Twin Peaks novelizations (well, they are not really novelizations). Lynch's book on Laura Palmer's life doesn't really work as an independent work of art (I find it difficult to fathom what a reader who hasn't seen any episode of Twin Peaks would get out of the book), but I enjoyed it nevertheless. I forgot to bring the biography of Dale Cooper with me, but I intend to read it nevertheless in the near future. I've given out misleading information. I thought Paul Malmont's The Chinatown Death Cloud Peril would be great, just what I wanted to read - but no. Hell, not indeed! I had to drop it even though I'd managed to make over the first half. The idea of writing a book about a couple of thirties' pulp writers (namely Walter Gibson, the creator of The Shadow, Lester Dent, the creator Doc Savage, and L. Ron Hubbard, the creator of, well, Dianetics; if you didn't know, he was a very prolific pulp writer in the thirties) is thrilling and intriguing, but Malmont can't get much out of it. The book would've been better if Malmont would've written a mainstream novel about these authors and dropped the pulpish action bits which he couldn't handle interestingly enough. He has to resort to subplots and such which make the book slow down. Even the beginning, which should set the tone and put forth the mystery, didn't really grab my attention. The best scenes are with L. Ron Hubbard, who is clearly a liar and an opportunist, but it seems that Malmont holds the man in high regard based on what he says in his afterword. What troubled me most is that Malmont felt necessary to drop authors' names and histories of publishing houses, such as Street & Smith. Some of these are absolutely unnecessary, such as mentioning Norman A. Daniels in one paragraph. And Malmont has a very annoying habit to make people talk about these matters in length in dialogue (one of the most boring scenes is the one in which L. Ron Hubbard talks about writing science fiction to a guy called Robert Heinlein who, in the book, hasn't as yet started his career as a novelist). It reminded me of goddamned The Da Vinci Code! Two of my fiction fanzines are out. Ässä came out just before we headed off to the cabin (more about that later) and Isku is, well, not actually out, but just leaving off to the printers. Ässä (= Ace) contains thirteen flash stories by such authors as CJ Henderson, Duane Swierczynski and Sean Chercover. Stephen Rogers wrote one especially for Ässä (so if there are any Stephen Rogers completists, they'd better ask me for a copy). I have a Joe Novak story in (well, naturally, since I'm the publisher) and there are also two archive finds: a story by Otso Kantokorpi from the Like Uutiset magazine in 1994 (published under the pseudonym Sam Tanner) and a story by Jussi Kylätasku from the Koti-Posti magazine in 1968. Apart from that, there's only one Finnish story, by Petri Laine. If there will be another issue of Ässä, I'll try to get more original Finnish stories. Isku, the hardboiled crime mag, contains a translation of a story by Bill Crider (to whom warmest greetings) and two flash stories by James Reasoner and David Terrenoire (thanks, guys!) 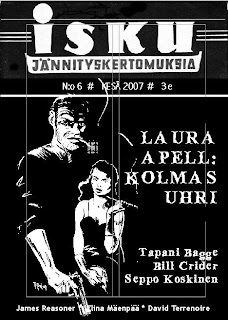 and several Finnish stories one of which is a reprint of the first crime short story the Tampere-based Seppo Jokinen wrote in 1990 (written at that time, but published only in 1994 in a small press magazine) . It's never been reprinted before. There are also new stories by other Finnish writers, such as Tapani Bagge and myself. I have also two lady debutantes, Laura Apell and Elina Mäenpää who both delivered great stories. Elina's story is more a horror story than hardboiled crime, but I don't really care for rigid genre rules. The cover illos are by Henri Joela (Ässä) and Timo Ronkainen (Isku). They really delivered, too! 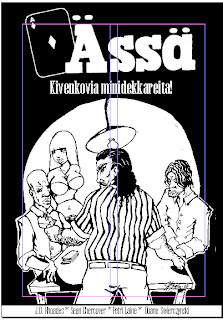 The Ässä cover is for the story by J.D. Rhoades called "Hundred". Kevin Burton Smith puts quite a load on new neo-noir lit here. An interesting point and I can agree with some of what Kevin says, but I'd really like to hear some names. Because I'll have to start packing (we'll be leaving in four hours' time and I'll have to go pick up Ottilia before that), I won't be talking about this more. Maybe when we'll get back. Before that: Happy Week to y'all! Please note: Ed Gorman talks sense too about neo-noir.